Arizona: The former preacher at a Jehovah's Witness church in Phoenix was arrested last night for allegedly playing strip poker -- and doing a lot more -- with a 14-year-old boy more than 30 years ago. 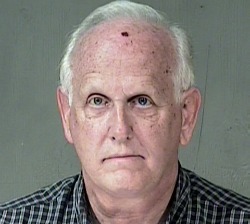 David Nelson, the former leader of the Madison Park Congregation Church near 16th Street and Earll Drive in Phoenix, was arrested last night at his home for molesting a boy he met through the church in 1980. Nelson was only caught because during a phone call with the victim, he admitted to the molestation. The conversation was recorded and given to police. Nelson's been charged with two counts of sexual conduct with a minor, two counts of molestation of a child, and two counts of public sexual indecency.